REACH conducted a study of the situation on the ground in Derna (Photo: REACH). Since July 2017, the eastern Libyan city of Derna has been subject to tight military encirclement. The closure of access points has made it difficult to supply markets, banks and health facilities, which has led to a deteriorating humanitarian situation for those remaining in the city, a report released last week by Swiss based NGO REACH said. The report provides some fresh independent information from the ground in Derna to help provide an accurate picture of the situation, in view of numerous conflicting and polarized Libyan media reports on the state of affairs in the city. The report stated that on 15 May 2018, the conflict in and around Derna escalated sharply, with rapid advances of the frontline, heavy armed group activity and unprecedented levels of shelling. As of 30 May, according to OCHA estimates, roughly 600-1,300 households had been displaced from outlying mahallas into central Derna city. To inform humanitarian response plans regarding the situation in Derna, REACH said that it had conducted a rapid assessment on behalf of the Libya Inter-Sector Coordination Group (ISCG) to provide a snapshot of the needs of displaced and non-displaced populations in the city. Between 27 and 30 May, with data collection support from Ofoq, REACH assessed the humanitarian situation in 11 of the 12 mahallas of Derna city. Data was collected through 32 multi-sector key informant (KI) interviews, 23 of them face-to-face and 9 remote, conducted with community leaders, NGO staff, medical professionals and others. The information in this situation overview should be considered indicative only, the report said. The tightening encirclement of Derna accelerated displacement into the core of the city. Most of the displaced came from the outlying mahallas of Hay as-Sayyida Khadija, 400, As-Sahil, El-Fataih, and to a lesser extent Embakh and Sheiha, all of which had experienced shelling and/or clashes in close proximity. Smaller numbers of IDPs from nearby areas, including Dhahr al-Hamr and Wadi an-Naqa, had also reportedly taken refuge in Derna’s central mahallas (El-Bilad, Dheil el-Wadi, El-Jebilah, AlMaghar, Esh-Shabiya and Bab Tubraq). At the time of data collection, according to KI estimates, these central mahallas consisted of 20-30% IDPs and 55-70% non-displaced persons. The outlying mahallas of 400, As-Sahil and Embakh, meanwhile, consisted of 85-95% non-displaced persons. Derna IDPs consisted disproportionately of women, children and the elderly. Many men reportedly opted to remain on their own property to protect their household’s assets. Those IDPs who left the city of Derna reportedly travelled first to nearby villages, in particular Martuba, and from there often moved on to larger cities such as Tobruk, alBaydah, Benghazi or Tripoli. At the time of data collection, the formal entry and exit points on the roads to Karsa and Martuba were open to civilians only sporadically: roughly twice per week for only an hour or two at a time, depending on the intensity of armed group activity. On 31 May, however, authorities announced that the western road to Al-Qubbah had been reopened and cleared of explosive hazards, and that the Karsa gate, located at Derna’s western entrance, would be opening regularly from 10 a.m. to 5 p.m. to allow families to enter and exit. Informal entry and exit points were largely inaccessible due to armed group activity. At the time of data collection, all roads leading into Derna were closed except to authorised vehicles. Residents of Derna were allowed to leave through formal entry and exit points, but could generally not re-enter prior to the reopening of the Karsa gate. KIs did not report that any civilian groups were being systematically prevented from leaving Derna, though families and medical patients were given precedence. However, residents suspected of being combatants or affiliates of political groups were generally turned back or detained, leading to several reports of harassment and violence against single men at entry and exit points. OCHA additionally reported that one member of a humanitarian delegation led by the Derna Red Crescent had been arrested while exiting Derna. All residents passing through formal entry and exit points had to present official identification. According to KIs, civilians were generally permitted to enter and exit the city using private cars. Commercial vehicles, however, could only pass with prior authorisation, which restricted them to carrying essential items. Those attempting to transit through any entry or exit point faced risks including shelling, sniper fire, landmines, verbal/physical harassment, detention and confiscation of their documents. 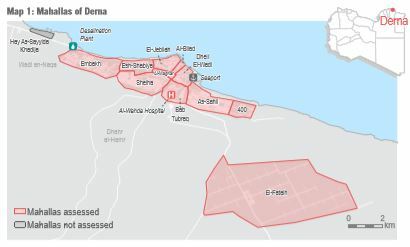 Across most Derna mahallas with IDP populations, 40-50% of IDPs were reportedly being hosted by family or friends (in El-Bilad and Al-Maghar, this percentage rose to 80%). An additional 10-40% were renting their own accommodation, with a greater concentration of rental properties in Bab Tubraq, Dheil el-Wadi, and El-Fataih. Non-displaced Derna residents generally owned their shelters (40-80% across all assessed mahallas), with another 10-40% renting their own accommodation. In the western mahallas of Embakh, Esh-Shabiya and Sheiha, 10-20% of IDPs were being housed in collective shelters. An additional 5-20% of both the IDP and non-displaced populations were reportedly living in informal settlements across six mahallas, which most often consisted of shelters built on state-owned land or households squatting in state-owned buildings. Overcrowding affected well over half the IDP population in Derna’s central and western mahallas, according to KIs in these areas. By comparison, less than half of the non-displaced population was reported to live in overcrowded conditions. KIs in nearly all assessed mahallas, excepting only El-Bilad, El-Jebilah and Bab Tubruq, reported damage to shelters in residential areas as a result of shelling. In Embakh, as many as 50% of houses were reportedly affected. KIs also reported widespread damage to the city’s electric, water, sewage and road networks. Government buildings in western mahallas were additionally targeted, along with the Al-Amal school, the Abu Huraira mosque and the Wadi Derna bridge. KIs in every assessed mahalla except Bab Tubraq and Dheil el-Wadi reported that local residents were unable to access food consistently over the two weeks prior to data collection. As elsewhere in Libya, residents of Derna still relied primarily on stores and markets for their food, but this norm had begun to break down due to market shortages. Borrowing food from others was reportedly widespread, along with relying on stored food and own production, all of which were much rarer strategies six months ago. KIs in El-Bilad, Dheil el-Wadi and El-Jebilah, and to a lesser extent in Al-Maghar and EshShabiya, reported that neighbourhood groups were offering limited food assistance to residents in need. Derna’s remaining markets tend to be concentrated in commercial districts. KIs in 8 out of 11 assessed mahallas, aside from the central mahallas of Dheil el-Wadi, El-Jebilah and Bab Tubraq, reported that there was no functional market in their mahalla. In most assessed mahallas, just one quarter to one half of traders were reportedly still operating, with this number falling close to zero in the heavily affected outer mahallas of 400, As-Sahil and El-Fataih, as well as in Bab Tubraq and El-Bilad. Where markets and stores were still operating, KIs reported frequent barriers to access. Markets tended to close altogether during times of heavy conflict, and residents often found it difficult to physically reach them, due sometimes to road damage and blockages and sometimes to a lack of transport or petrol to get there. KIs reported widespread shortages of fresh vegetables, fruits, milk and many types of meat. Flour and tomato paste were also subject to localised shortages, though these were least frequent in mahallas with functional markets. Shortages of subsidised flour in particular were observed throughout eastern Libya in April and May due to problems with the central supply. All other assessed food items and NFIs were reportedly available, but were considered too expensive to regularly afford. All KIs reported that no cash was available from banks or ATMs in Derna, as commercial vehicles were not authorised to bring cash into the city to replenish bank supplies. As a result, the use of hard cash in market transactions had become relatively rare. Most transactions had begun to take place via either certified cheque or voucher, generally with a 30-60% mark-up; bank transfers were also in wide use. This, however, presented its own problems, as lengthy delays in the payment of government salaries and benefits meant that residents’ bank accounts were becoming depleted as well. Only one hospital in the city of Derna, Al-Wahda in Bab Tubraq, continued to function. Since 20 May, however, the hospital has been admitting only urgent cases due to severe shortages of generator fuel and medical supplies, particularly oxygen tanks. Starting on 29 May, Al-Wahda began to receive its first shipment of medical supplies since March, though it has not yet received enough aid to be able to take on new patients. Medical professionals report continuing shortages of dialysis medication, syringes, oxygen tanks, antibiotics, insulin and generator fuel. On 29 May, Derna’s main water desalination plant, located near the Karsa gate, suspended operations due to nearby clashes and insecurity affecting its staff.8 As a result, the main water network largely stopped functioning throughout the city, except in Sheiha, where the network was fed partly by wells. Shortages of bottled water were reportedly developing due to a sharp increase in demand coupled with the extended closure of all roads into Derna, which made it difficult to resupply markets. Derna’s volunteer-driven trash collection services continued to operate, though with diminished capacity. Residents generally continued to leave their trash in designated, though unofficial, public spaces for pickup, including streets and schoolyards. However, the pace of pickup was inadequate; KIs reported that trash was collecting in the streets so quickly that it had to be burned to prevent road closures. At the time of data collection, formal schools in all assessed mahallas were indefinitely closed to all students due to the armed conflict. KIs reported damage to educational facilities due to shelling, including the Al-Amal School. The presence of explosive remnants of war (ERW) was reported in all assessed mahallas. Landmines were additionally reported along the main roads leading out of Derna, in particular at the city’s main entry and exit points. On 30 May, according to reports, an improperly disarmed landmine exploded near the Karsa gate, resulting in civilian casualties. KIs in all assessed mahallas reported injuries or casualties that could be attributed to explosive hazards, with the highest number in El-Fataih. Among Derna’s non-displaced population, the top humanitarian needs, as reported by KIs, were safety/security and healthcare: specifically, the reopening of closed hospitals, the resupply of medical items and the offering of a wider array of healthcare services. KIs also cited cash, food and water as areas of significant need. Needs among IDPs were broadly similar, though the need for shelter was much more acute. In most mahallas, residents reportedly had a strong preference for cash-based interventions. The only exceptions were in As-Sahil and Al-Maghar, where KIs reported a slight preference for in-kind food aid.